Blowout Sale! 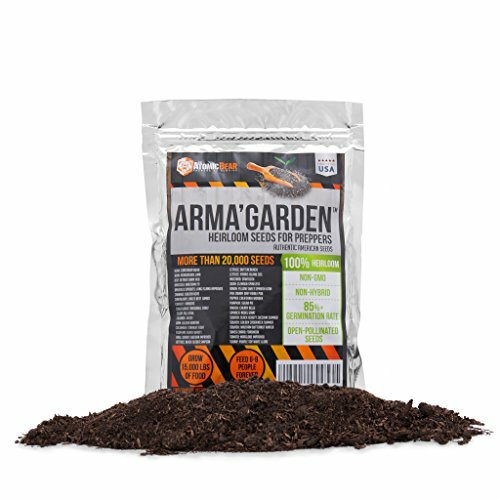 Save 63% on the Atomic Bear Heirloom Vegetable Seeds - Non-GMO, Non-Hybrid, Open Pollinated Seeds to Grow 32 Variety of America Heritage Vegetables - Essential Survival Food for Off-the-Grid Preppers Garden by Atomic Bear at The Net Stores Network. Hurry! Limited time offer. Offer valid only while supplies last. This Survivalist Vegetable Seed Pack is designed to grow the most tasty and gorgeous garden from Non-GMO, Non-Hybrid, pure authentic American seeds. ✅ AMAZING QUANTITY OF VEGETABLES WAITING FOR YOU : 20,300+ seeds for 32 gorgeous heirloom non gmo, non hybrid heritage authentic vegetables MADE IN USA. ✅ HIGH QUALITY AND MOST AFFORDABLE: seeds coming only from the high quality parents, hand harvested by organic U.S. farmers. This package purchased in a national store costs around $200. ✅ PERFECT FOR OFF-THE-GRID PREPPING: These survival seeds can be collected back from the garden and reseeded the following years.